For those of us who are addicted to espresso, drip coffee sometimes doesn’t cut it. If we go to Starbucks every day, though, it can really put a strain on our wallets. The answer can be found in one simple device. 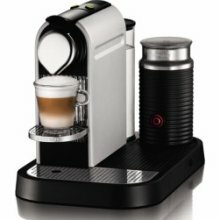 The convenience of the Nespresso CitiZ C110 espresso maker will satisfy your espresso craving and give you a variety of drink choices. As a former barista, I was used to the ease of perfect espresso at any time, but I found many home espresso machines to be awkward and difficult to keep clean. When my friend showed me her Nespresso coffee maker, I knew my problems had been solved. After a few swift and easy moves, I saw her machine draw a perfect shot of espresso. Like the popular Keurig coffee makers, Nespresso machines use small capsules or pods that contain pre-measured coffee. They are available in a variety of flavors, decaf, and special blends that are made for those who like double shots (the machine lets you program a long draw!). The nice thing about pods is that there’s no need to buy ground espresso, tamp it, and figure out how to get a perfect draw. With the CitiZ C110 machine, you turn it on, pop in the pod, press a button, and you’ve got perfect espresso. The machine itself features a one liter water holding tank, a drawer that holds up to 15 used pods, and a 19 bar pressure pump that provides the power for the brewing. It also has a platform that is the perfect size for an espresso teacup, but the platform can fold up if you want to catch your espresso in a taller cup. Different from the standard CitiZ C110, the CitiZ & Milk C120 comes with a milk warmer and frother called the Aerrocino (it looks like a thermos) that allows you to make cappuccinos or lattes. Simply pour the milk to the fill line, push a button, and the milk will spin and froth on its own. It has two attachments: one for lots of froth, and one that is designed to spin the milk to help heat it. The foam rivals that of any coffee shop. It is much easier than trying to use a crazy attachment or nozzle that will get clogged up and make the entire machine unusable. The coffee pods themselves are a little pricey, at about $0.50 each. But even if you use two pods at once, it still only adds up to $1.00, which is much cheaper than espresso you can get anywhere else. You can also only buy the pods online at Nespresso.com. They arrive very quickly, though; I always get my order within two days of purchase. As if the benefits of owning my own amazing espresso machine weren’t enough, Nespresso provides an outstanding service package. If any part of the machine malfunctions during the warranty, they will send you a replacement machine while your machine is getting fixed—you don’t have to go a day without your coffee. After reading the Nespresso guarantee, I was sold. There are four models of machine by Nespresso: the Essenza, the Pixie, the CitiZ, and the Lattissima. Each machine does basically the same thing, but they have different sizes of water holding tanks. The Lattissima is quite a bit more expensive, but it can dispense foam for cappuccinos and lattes directly from the machine. The Pixie is more of a portable machine, and the Essenza is for the person who drinks several cups of espresso a day. All the machines are available in a variety of stylish colors: black, titanium, 60s white (kind of a cream color), silver, and red. If you enjoy a daily latte or cappuccino, the Nespresso CitiZ C110 or the CitiZ & Milk C120 is the machine for you. If you’re more of a drip coffee kind of person, you can stick to Starbucks or your favorite espresso stand for your occasional specialty drinks. The machine is pretty expensive, so it is definitely an investment. But if you are already breaking the bank paying someone else to make your coffee, it’s worth the price. It will eventually pay for itself, and you can enjoy top quality espresso in your own home along the way. The problem with the nespresso citiz and milk is that the frother will work for a very short period of time and then it will just stop working. Unfortunately there are so many complaints on line about this malfunction and the only advice given is to clean the frother! Not great advice for a machine which costs £200. The only real reason to buy this model is because the coffee drinkers like to have milk with their coffee, but be prepared to only have it for a few cups, then it’s back to drinking coffee exactly the same as if you poured it from a kettle and added milk……..but for the bonus price of £200!!! I’m very angry as this was a wedding present and i cleaned the frother and milk container each time i used it as I care about my coffee. Not impressed with this make or model. Too bad that after a month or so of occasional use, it now pours the coffee inside the used pods’ tray and not in my cup! I’ll try to get another one from them, as it must still be under warranty.